Odfjell, with HQ in Norway, is a leading company in the global market for transportation and storage of bulk liquid chemicals, acids, edible oils and other special products. 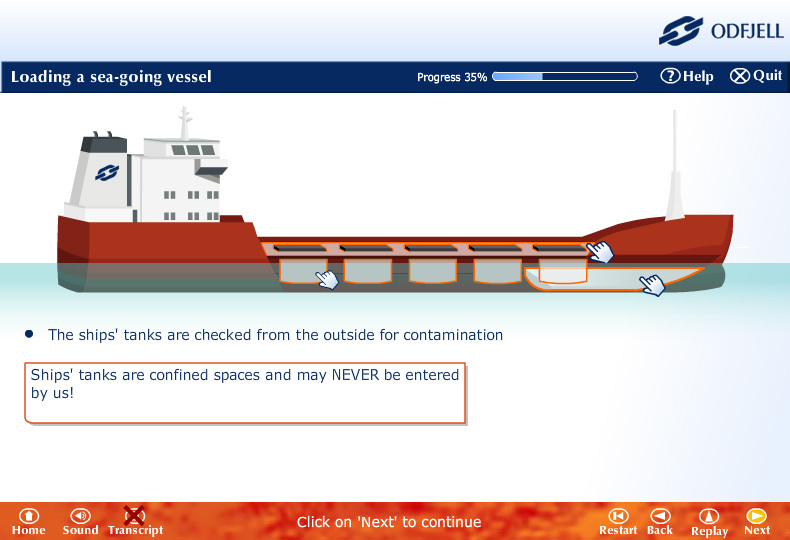 They operate many tankers and terminals around the world, and the requirement was for training to ensure employees understood 1) the properties and dangers associated with the products being shipped and 2) the processes and working methods required to unload or load tankers safely to and from onshore storage. The final deliverable was to be in both English and Dutch languages, and additionally satisfy safety requirements and terminology used in the USA. The system was also required to be linked to the SCORM compliant LMS system being adopted by Odfjell. We started by collecting as much material as was available to understand the products and the processes involved. Odfjell appointed subject matter experts from the Rotterdam terminal to supply all the technical information and ensure all Dutch translations were accurate, plus Norwegian coordinators to link to both the USA and Norway operations and IT support. Two initial meetings were held, firstly at the Rotterdam terminal so that Logicom personnel could see and understand as much of the processes and existing training as possible, at the same time taking photographs and collecting information. Secondly Odfjell personnel visited the Logicom offices so that we could demonstrate different technical solutions and agree what was most suitable to be used. After that, apart from the final sign off meetings, all regular technical discussions and demonstrations of progress were made using the Internet and conference calls. After much debate, it was decided that the training could be delivered most effectively using 3D modelling and creating and using fixed animations. This allowed us to very effectively show the inside of storage tanks, pipes etc and give a visual representation of what the potential chemical and physical reactions might be, given factors such as temperature, pressure, flow rate etc. There was potential for creating some interactive virtual reality scenarios, and this was discussed in detail. However, we believed that for ease of distribution and deliver of the training, plus the potential additional complications, time and cost required to complete the development it was not included in the specification. The final training was delivered to run from a CD, over the company network or over the Internet. The training was broken into two parts, Product Knowledge and Working Methods, with each part broken down into many modules. The modules could be repeated as many times as the trainee required and but not timed. Progress through the training is tracked and at the end of each of the two parts, assessment tests were set which incorporated multi choice questions, interactive 2D questions and randomly selected questions from a bank of questions. The results of the tests were then transmitted directly to the LMS system held at the Odfjell headquarters.